This organic version is just like the Side Snap Simplex but this version is made of organic cotton inside. 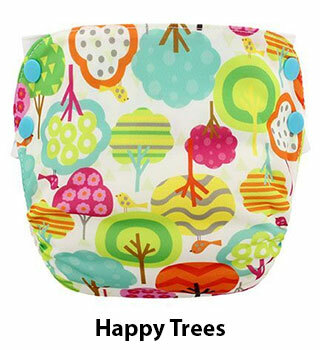 The unbleached organic cotton is organic prefold diaper fabric. It is very soft and the quilty fabric will require some flattening which is the nature of the prefold fabric. 12 layers of organic fabric smartly sewn to dry quickly with a pocket opening at both ends. (some of the photos show white cotton, however these all have unbleached organic cotton inside, not white). 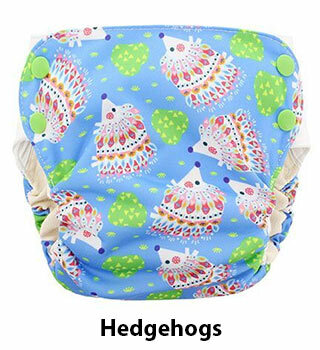 While this is truly an all-in-one diaper, we are also including it under "potty training" because the stretchy sides can make it work as a pull-up and pull-down diaper for the early stages of potty learning. It definitely is a diaper, but sometimes a diaper that can work as a quick pull-down is just the thing that is needed. Again, this is not the intended use, but depending on baby's shape and size, it sure can work this way as an alternative use. This is also wonderful for EC (elimination communication) for times when a pull-up, pull-down diaper is needed. Side Snap Simplex by Blueberry is a good name for this all-in-one diapers because it snaps at the sides. This name helps to distinguish it from the one-size version. Really very stretchy! The cut is trim across the bottom. Average sized bottoms might really like this trim fit! 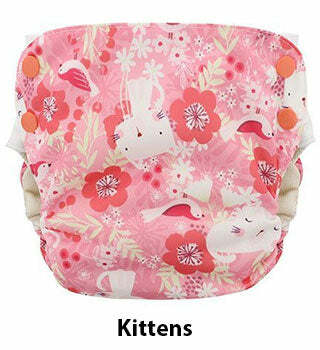 Wide babies with big bellies can get a comfortable fit from this because the sides are so very stretchy. As cloth diapers go, this diaper is not bulky at all. So cute and handy for quick changes. Keep one in your diaper bag to use and also to show off to your cloth-nay-saying friends. Karen doesn't recommend it at night because the stretchy side tabs are absorbent, unless you are choosing it for night for the special feature of being able to possibly pull it up and down for potty learning. If baby has just outgrown the Newborn Simplex, the medium Side-Snap will still be too big on baby in the rise for a little while yet. The sizes don't quite flow into each other and there is a size jump up from newborn to medium. Made in USA. I am a big blueberry diapers fan. Their covers are the best lasting, most leak proof and cutest covers I own. I recently bought several of the regular simplex versions and love them! They are so trim and amazingly absorbant. These side snap simplex are very cute as well, and trim also, but I’ve had several leak issues. It seems that the tabs laying against the absorbent part inside wick moisture all the way across the tab, even the part that sticks out past the snaps, which often leads to wet spots on clothes. I have a super chunky baby of 22.5lb at 7 months so i ordered size large. Even still we’re not on the smallest snap setting and the exposed part of the tabs are often wet at diaper change. I love how stretchy the tabs are though, and can see how this could be a great potty training aid. I wonder if this problem will decrease as we get towards the larger snap settings because less of the tab will be touching the inside. As long as I remember to do diaper changes often (less then 2 hours) with these they work well. And the prints are adorable. These work well for outings and quick changes during the day. The prints and organic cotton are fabulous. They fit perfectly on my chunky-thighed 15 lb baby with plenty of room to grow. I’d prefer them to be styled as a wrap like the Newborn Simplex but these are definitely nice for under outfits. My 2.5 year old is potty trained but was still wearing a disposable diaper at night. I wanted to reduce waste and I wanted him to feel wet when he did pee, so this was the solution. I don't add additional absorption, so his pajamas do get wet when he pees. So far the diaper is absorptive enough that the pee has not penetrated through his sleep sack and the bed is pee free. He is usually dry all night but sometimes pees in the morning before he is fully awake, so a lot comes out. This fits really well for my 35lb child. I like that the snaps are on elastic that is very stretchy. It doesn't feel too tight, but still contours to his body. It also doesn't feel bulky, and the organic cotton is very soft. It has been 3 weeks, and so far we are very satisfied. First purchase from green mountain that I’m unhappy with. The elastics on these are so thin that a snap already came out. I’ve only used this diaper 4 times. These would definitely be better for potty training when just pulling these on and off, rather than unsnapping every time. The elastic side snaps cause leaks as well, so definitely better on on older baby. The snaps work fine! Cute, trim and super easy for a wiggle baby! Personally, I like to hand wash them while she sits on the potty, quick and easy. Takes extra soap if they sit awhile.